Prominent & Leading Manufacturer from Faridabad, we offer flanged nut, u clamp, strap clamp, mould clamp, t-nuts and spherical seat washer. Flanged Nut is a washer-like base to evenly distribute the pressure over a large surface area and make sure the fastener stay tight. It is widely used in manufacturing assembly lines where operations are fast by using a single fastener instead of a nut and washer. We are offering U-Clamp to our clients. 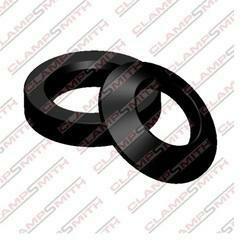 We are offering Strap Clamp to our clients. We are offering T-Nuts to our clients. We are offering Spherical Seat Washer to our clients. 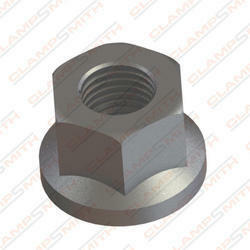 Our Extension Nut is used to couple the studs with T bolts or normal studs in order to increase its length. It is very beneficial for the machines having 'T' slots, assorted setting elements, jig fixtures hydraulic equipment and adopters. It is known for its rust resistance surface and smooth black finish. 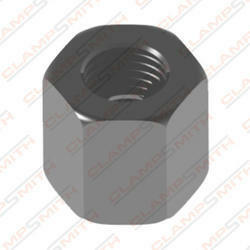 These nuts are used to couple the studs with studs or T¿¿ Bolts in order to increase their length. We are offering Extra Long Nut to our clients. 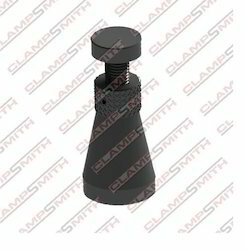 The Goose Neck Clamp suitable for machine shop clamping. 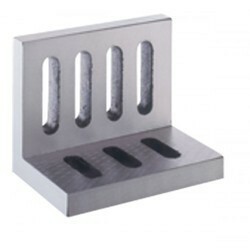 This is mainly designed for holding/clamping of dies, press tools, casting while machining. It is well-known among the customers for their qualitative features like durability, excellent performance and high strength. 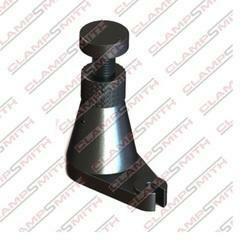 Goose neck clamp are made up of S.G.I steel in 500/7 grade. Used in holding of press tool and huge castings/dies while machining. Knurled C Washer is best for clear loading because it can be repositioned, inserted and removed from the workpiece at any time. It is designed to be slide in and out of position on a bolt and also used as a retention device on a well-grooved shaft to keep components in place. 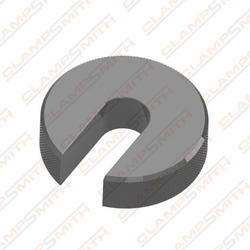 C Washer have knurled outside diameter for easy gripping while quick insertion or removal. 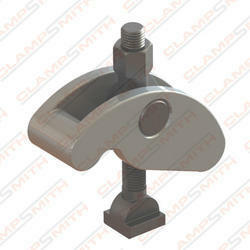 The Adjustable Support Plates are widely used as adjustable supports at the rear of the clamp. It is made from number of plates having same thickness hinged together. Different types of models can be stacked on each other to attain the extra height. Adjustable support plates are used as adjustable support at the rear of the clamp. It comprises of number of plates each 2mm thick hinged together. Desired height is achieved very easily by swinging aside the required number of plates and using the remaining as support block. T-Bolt provide uniform sealing pressure for reliable seal. Mainly designed for high vibration and large diameter applications like heavy trucks, industrial machinery, agricultural irrigation and machinery. It is features a stainless steel band and welded construction for reliability. Tools Available T Nuts, Clamping Studs, Flanged Nuts, Extension Nuts, Strap Clamps, Adjustable Support Plates etc..
Clamping kit - 58 Piece is available in an attractive powder coated metallic rack which can be hanged on machine or a wall or kept on a table. 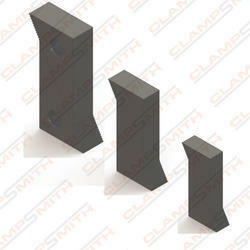 Each kit consists of all important clamping elements required to clamp a variety of work pieces. Following table shows the contents of each model of clamping kit suitable for different T-Slot sizes. All the items of clamping kit are taken from our range of products given in this catalogue. 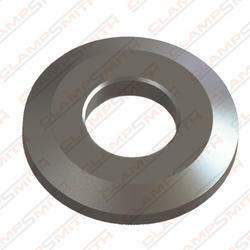 A Plain Washer is a thin plate with a hole (mainly in the middle) that is mainly used to distribute the load of a threaded fastener, like as a screw or nut. in addition, this type of washer may be used when the hole is a big diameter than the fixing nut. We are offering the Leveling Jack Heavy Duty Flange Mounting to our clients. 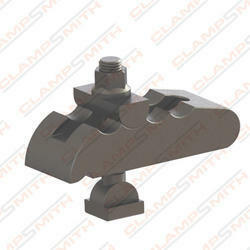 Leveling Jack can be used as an adjustable support block for clamps and as a stopper or leveling block in fixtures or machines, as well as for leveling surface plates or other heavy duty workpieces. Its unique design does not allow the leveling screw to rotate while adjustment, hence makes it suitable for fine level adjustment. Leveling Jacks can be used as an adjustable block for clamps and a stopper block in fixtures of machines. 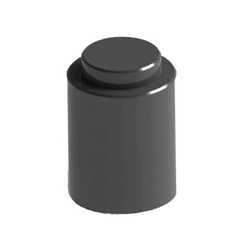 Their unmatched design does not allow the leveling screw to rotate at the time of adjustment, therefore makes these blocks are suitable for fine level adjustment. We are offering Heavy Duty G-Clamps to our clients. 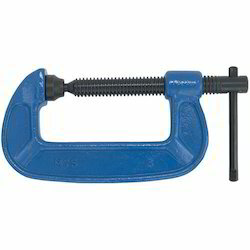 Heavy Duty Pinch Clamp is made from hardened alloy steel and its welded construction for superior strength. 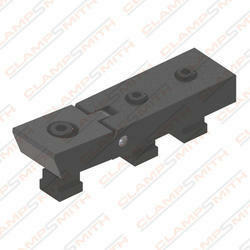 Compatible with all clinching tools, this clamp is useful for Shaping, Planning, Milling and Jig boring machines. 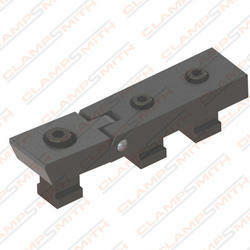 These clamps are offered in heavier version of the above clamp for clamping heavy blocks. Basic function is same but this is used for claming from sides of heavy blocks or thicker plates for facing top face in one setting. 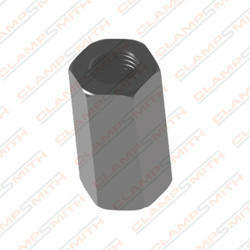 It is made up of hardened steel and supplied with T-nuts and standard bolts. We are offering Stepped Strap Clamp to our clients. 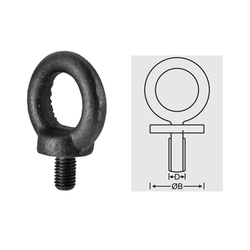 Hardened a tempered, High Tensile Steel, Black Finish These Studs are used on machine beds having tapped holes. They have a longer threaded length on one side for longer insertion in the tapped holes of molding machines. 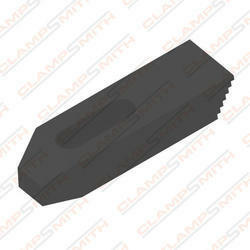 These studs have a flattened middle portion for tightening and loosening with the help of an open-ended spanner. 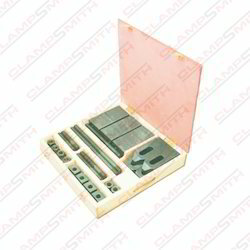 Clampsmith is economical clamping kit housed in an elegant wooden box. All the details are enclosed in attachment which shows the content of each model of clamping kit suitable different T-slot sizes. All items are taken from our range of products given in catalogue. 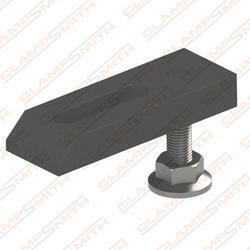 We are offering Clamping Studs to our clients. We are offering Angle Plate Slotted to our clients. 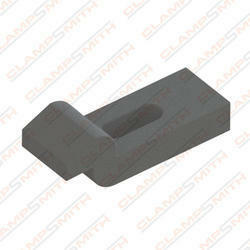 We are offering Pinch Clamp to our clients. U-Type Special Mould Clamp is widely suitable to hold injection moulding machines and die plates. It distributes the load & holds the clamps. You can easily adjust its height with the help of hex and round base lock and nut. 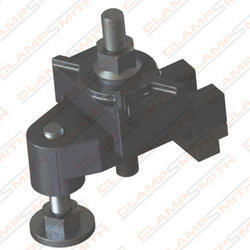 It is one of the conventional type clamping system made up of S.G.I steel in 500/7 grade. Used in clamping of heavy moulds on plastic injection moulding machines and pressure die casting machines. It comes with forged stopper bolt for the height adjustment and special washer at top of clamp to move the bolt in slot desired portion. It is used to clamp different sizes of moulds on same machine through it height adjustment feature. It helps save the time of the operator while changing the mould on machine therefore increase the productivity. 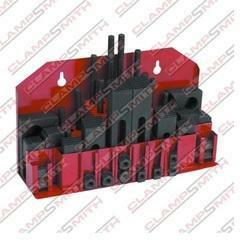 Step Blocks are used as adjustable supporting blocks at the rear of the clamps while clamping the workpiece. Different heights can be achieved by using combination of two different sizes of step blocks. Available in pairs (pair consists of 2 identical step blocks) combination of two step blocks of same or different sizes is kept as support under one strap clamp. But in case of use of step blocks with stepped strap clamp, only one step block of suitable size is kept as support under one stepped strap clamp. Step Block-Heavy duty is different then step block above in width only, more width enables use on bigger T-slots and also with bigger sizes of stepped strap clamps. Height Blocks Leveling Jack can be used as an adjustable support block for clamps and as a stopper or leveling block in fixtures or machines, as well as for leveling surface plates or other heavy duty workpieces. Its unique design does not allow the leveling screw to rotate while adjustment, hence makes it suitable for fine level adjustment. Hardened Tempered, Black Finish Tapped End Clamp With Adjustable Support are most useful clamps for injection moulding or pressure die casting machine where mould/die is clamped in vertical position, these clamp have adjustable support to adjust the thickness of mould plate. Heavy Duty Flange Mounting Leveling Jack with the flanged base for mounting on machine bed for additional rigidity. 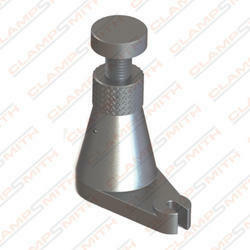 Low High Pinch Clamp is very useful for job clamping where top surface of the job is machined in single setting. It is mainly designed to fit polyethylene & polybutylene water service lines and best for irrigation systems & other low-pressure applications. For machining center, Milling, Shaping, Planning, Jig-Boring etc. Used in machining centre, milling, shaping, planning, jig boring etc. 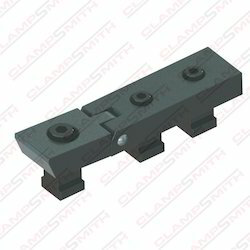 This clamp is useful for job clamping where complete top surface of job is to be machined in one setting and hence can be clamped only from side faces. When serrated front portion is pressed against the job by tightening the front bolt, it gives a downward as well as forward clamping force. 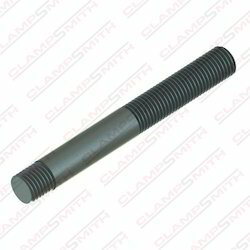 It is made up of hardened steel and supplied with hardened T-nuts and standard bolts. Universal Strap Clamp is widely suitable for die clamping on power presses & a widely useful for job clamping on 'T' slot table of Drilling, Shaping, Boring, Milling and other machine tools. No requirement of support at the rear of the clamp as the body of the clamp is self-positioning. 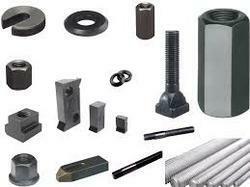 For power presses, milling, drilling, shaping, boring etc. It is made up of S.G.I steel in 500/7 grade. It is used on T-slot beds of various machines like milling, drilling, sheet metal presses, shaper, boring machines etc. It's front portion holds the die and rear portion adjust on the bed of the machine with its design itself. 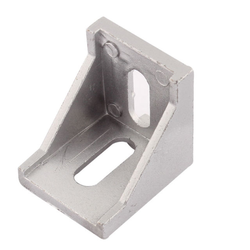 We are the manufacturer and supplier of the Aluminium Bracket to our clients. 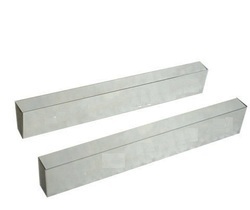 Steel parallels are used as precision packing supports under jobs or fixtures. Made from special alloy steel, hardened and tempered. Precision ground in matched pairs. Parallelism with in 8 microns up to 200mm length. 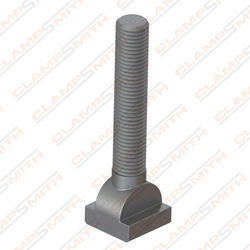 The Eye Bolt is used for light duty applications. It should not be used for angular loads. It is externally threaded fastener known for its narrow loop that secure cables, wires, as well as chains to assist with vertical lifting.